“Kembangna cilaka, buahna pati “ (The opening is damaging, the substance is deadly) describes the brutality of the original version of this style, previously called “Gulung Maung” style, which comes from the Padjajaran kingdom. Eyang Guru H. Abdullah (±1800–1916) later shape the style to make it more ‘civilized’ and softer, reducing the brutality of the ‘maung’ (tiger) within the style. Thought with the closed-door system, limited only to family and relatives, the teaching is currently conducted by Kang Awang as one of the licensed instructor who is legitimate to teach the system. 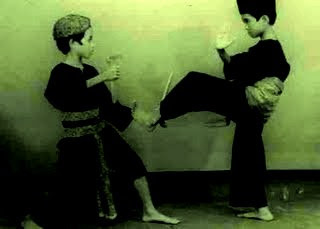 This is "Silat Workshop GGBD" on 20th December 2008..
you can follow the link for GGBD here : "Aliran Pencak Silat / Re: [Fenomena] Silat Jabar "GERAK GULUNG""
*kang guru sarung kampret, ane tambahin link nya yee..